We love hen’s parties and parties in general as you can imagine we attend quite a few, in the busy months this can be 200 parties ever weekend! So we get to see a lot of great hen’s and birthday party ideas. Plus we have researched some of the upcoming trends and want to show you some of our favourite hen’s party ideas, accessories and themes from around the world. Everyone’s been to a hen’s party or kitchen tea where the theme involved the standard hen’s party tutu or pink cowboy hat. But here at Butlers in the Buff we know you want the hen’s party that you are organizing to be original, fun and classy. Although, you may still want to let the world know or just your hen’s gang that you belong to a unique and elite group just for this weekend. 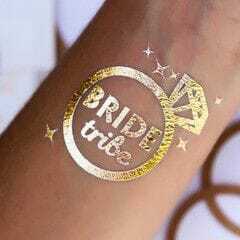 So you may wish to brand your hen’s party weekend with funky personalised t-shirts, hats, or simply use a classy hen’s dress code or even more subtle go for non-permanent gold tattoos. # 1 – Everyone dresses in black but the bride-to-be who wears a white or a colourful dress. Or everyone wear white and the hen wear something bright! 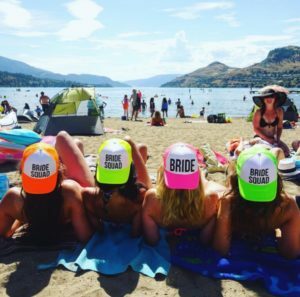 # 2 – We just love these personalised baseball caps – ideal for hens beach parties or if you are going on one of our catamaran cruises around the harbour. 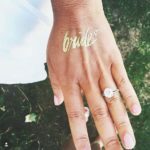 # 3 – Does your hen’s group want to be subtle, classy, with a hint of sparkle? 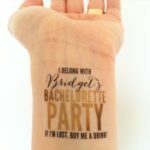 These personalised hen’s party temporary gold tattoos are to die for. Fun, chic and glittery! 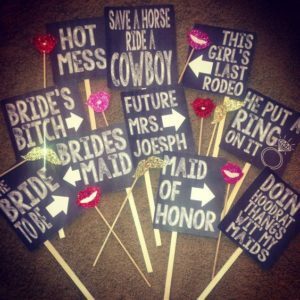 # 4 – Personalized hen’s party signs. Just in case your hen’s party or bridal shower needs a little direction these personalised signs are great to have around your venue or even for a photo booth style dress up box. 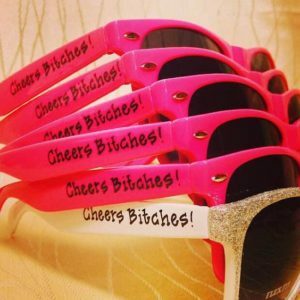 # 5 Fantastically colourful and personalized hen’s party themed sunglasses. Ideal for a summer hen’s weekend or a chic beach party. Don’t forget to checkout our Party butler cruises. Available in Vancouver, Sydney, Bath (UK) and New York! And of course no party is complete without a Butler in the Buff or two… So don’t delay and book your naked butler from Butlers in the Buff today!